In many occasions, be it a party or a small get together we may have the compulsion to eat still some few more food recipes when already our stomach is full. This may happen to anyone in this world on rare occasions. But there are many people who pretend to keep on eating even after their tummy is full and are said to be suffering from a disease or a disorder in their immune system. 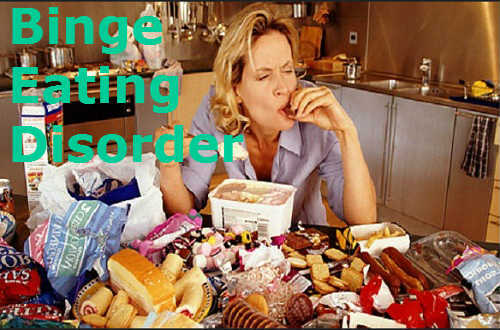 In this article we will clearly see about binge eating disorder, its causes and symptoms along with the remedies for the disorder. People who are unable to control themselves from eating a huge amount of food even after their regular food and keep on eating, also called overeating is said to have been suffering from the binge eating disorder. This disorder many develops in people in their teen ages or at the start of their adolescent ages. During the initial stages they often start eating soon after their regular food time having a feeling of an unfilled tummy soon after their regular meal. They slowly start to develop this habit and finally start to eat all along the day even when their stomach is full. Having uncontrolled thoughts and pressure in the mind after consuming their regular meal. Making the habit to be regularly addicted and denial of other factors. Do not make any attempts to reduce the disorder. It may fine for many people of this quality at present, but as days pass by they would surely face some serious health problems which they may feel that it is OK and continue the same habit until one day they risk their life because of their binge eating habit. Normally when such quantities of food are consumed at regular intervals, leads the person into various types of health issues like the diabetes, random increase of body weight level and also serious problems with the heart. At one stage they will be pushed to a position where they would be burning out all the calories and other unwanted fats from their body by cutting out their regular diets and following to a simple diet which helps them to save their life. Exposure to types of cancer. The brain in our body provides and controls all the actions and message passing in our body. Sometimes they may have been interrupted by various issues which force the brain to give incorrect signals to the other organs about the hunger. When this occurs then wrong message passing from the brain does not allow the body to eat only at the hunger time and may induce you to consume food whenever it is possible. This issue is said to be the biological aspect behind the problem. Many parents in the home often point out their children for not eating properly from their early ages and have developed it as a habit till now which in turn has induced the children to consume more food than they usually eat. At times the children lose their emotional stability and are moved to food to show their anger towards someone or something. These small practices at times have now become a regular habit for the children who are now termed as the binge eaters. There are several good methods which can be practiced to help you getting relieved from the disorder. Instead of consuming your regular diets, eat the diets prescribed by practitioners even if you don’t like them. Consider them as your life-saving supplement and maintain a good rapport with the dishes you are provided. There are some strategies which can be followed to eradicate the habit of binge eating disorders. But the thing is, you should make yourself strong enough in following these strategies until you are fully relieved from the problem. Try managing all your emotions and pressures and keep them under your control. Once you start keeping things under your control, there is no need of your mind to think about immediate diversion towards food. Some habits to overcome the above problems are attained by meditation or yoga. Control your food habits and tongue to stick to a regular time table of food plan every day and some amount of snacks can be included in the diet plan. But make sure that you eat at the regular food timings unlike others and also stick to one snack per day. Never try to remain in fasting to stop this disorder. Once you do fasting it normally slows down the entire functioning of the body and also creates the hunger in you and when once you start eating it is evident that you will break out all the food schedules that have been proposed for you. Do not remain awake long hours during the night and skip the sleep. Try getting ample amount of sleeping hours every night.